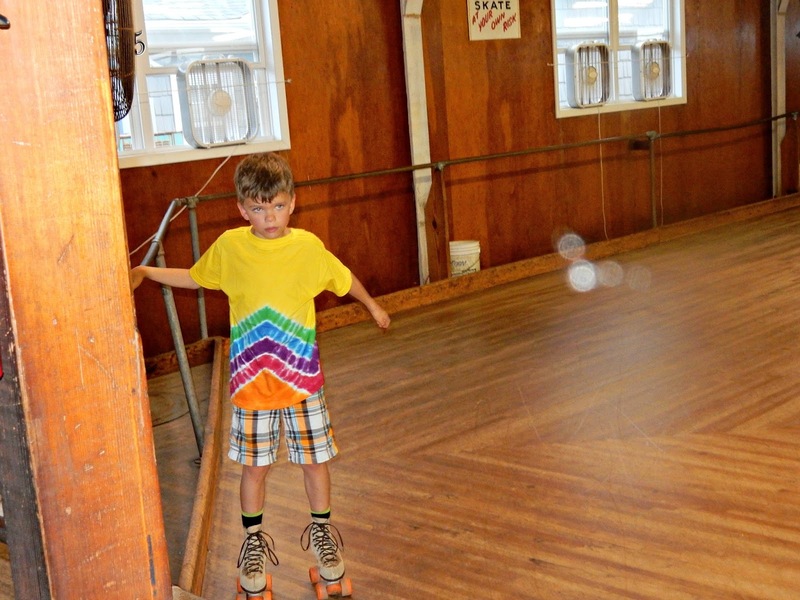 When we were at the beach, we discovered there was a roller skating rink above the post office, that had been there, unchanged, for over 50 years. 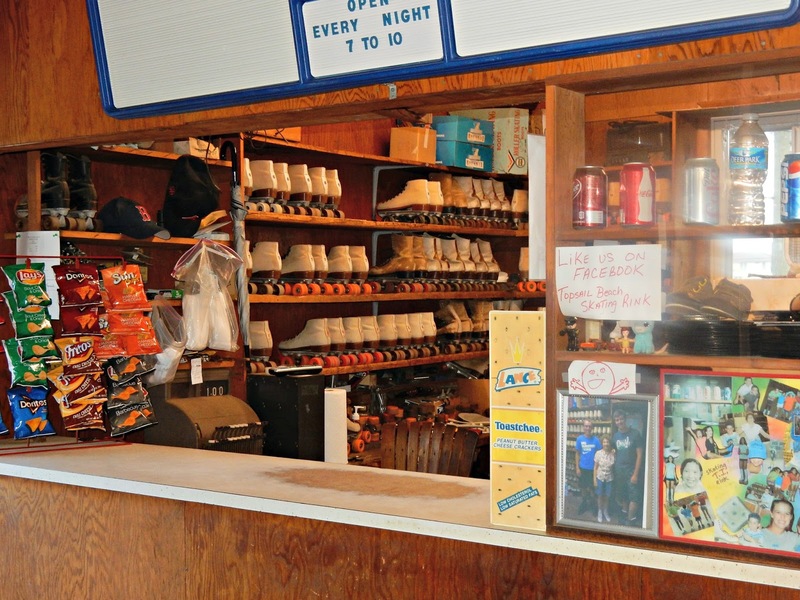 It was open every night from 7 - 10. We knew we had to go. It did not disappoint. The place didn't even have air conditioning! They did, however, have fans blowing in the windows and on the ceiling. Poor Reid. Let's just say that roller skating doesn't come natural to him. He gave it a good try though. So check this out. All those skates? I don't think they've ever been updated. 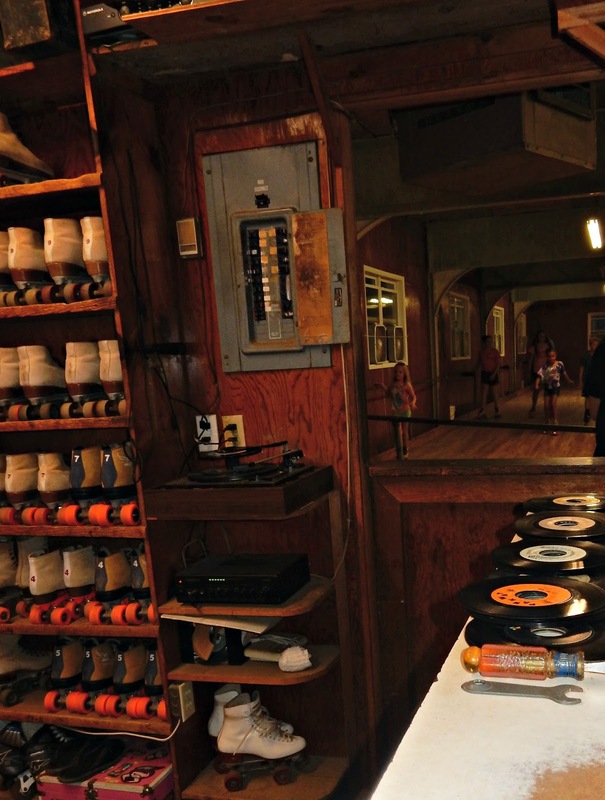 For $6 a person, you get to skate as long as you want, and the skate rental is included. Look at all that wood! 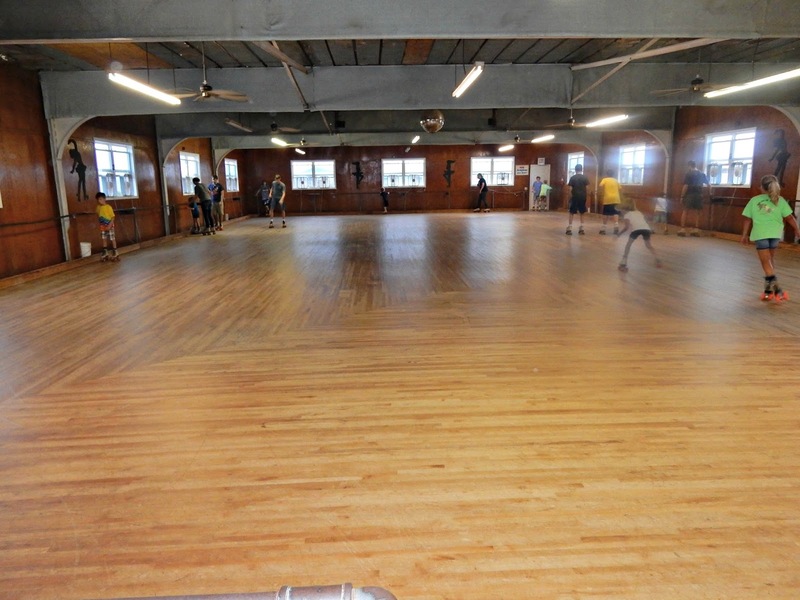 The floor was beveled in a few spots, which just made things more interesting. How do you like Pierce's outfit? He dressed himself. He also put his shirt on backwards. I told him, but I guess he didn't want to mess with switching it around. At least they look happy. And hot! Cort got a little grumpy as the night went on - he was so mad that he couldn't skate like he wanted or do tricks. 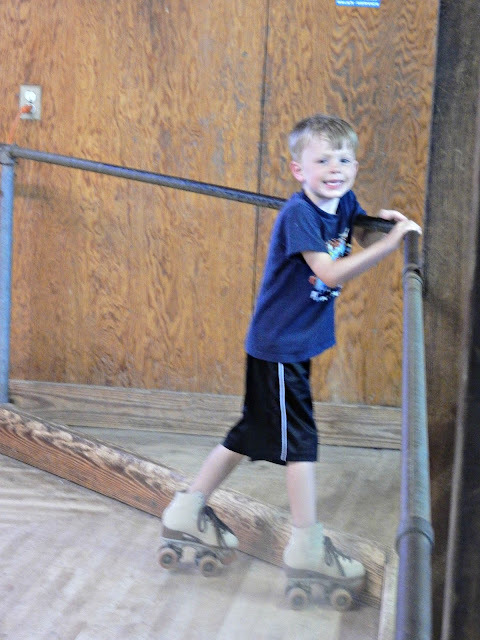 He actually did very well, considering it was his first time, but he is one stubborn kid, and I think he wanted to be able to do figure 8s and jumps. Here, Paul supports Reid, who spent a lot of time on the ground. I tried to support him for a while, but eventually I thought my arm was going to fall off. When I said old school, I must say - the owner (who has owned the place forever) plays 45 records. Most of the songs are from the 50s and 60s. But at one point she played Elvira. Talk about a good time. 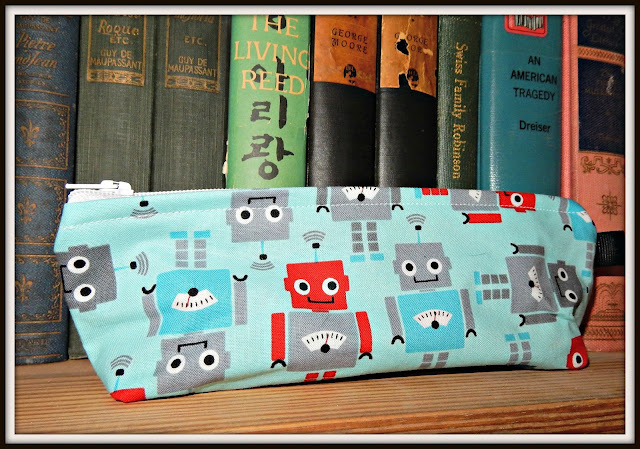 Readers, have you been delighted by any old school finds lately? This post was sponsored on behalf of CLIF Kid via One2One Network. All opinions stated are my own. 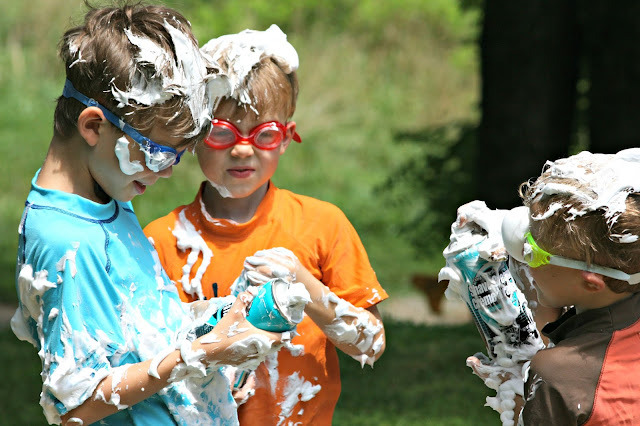 Outdoor play is very important to our family. We want our kids to be able to unplug and develop an appreciation of nature. 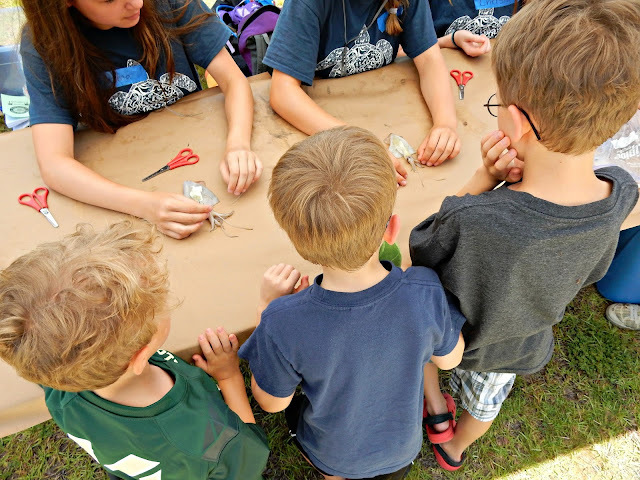 We want them to have creative critical thinking skills to work through situations that you might encounter in an outdoor environment. 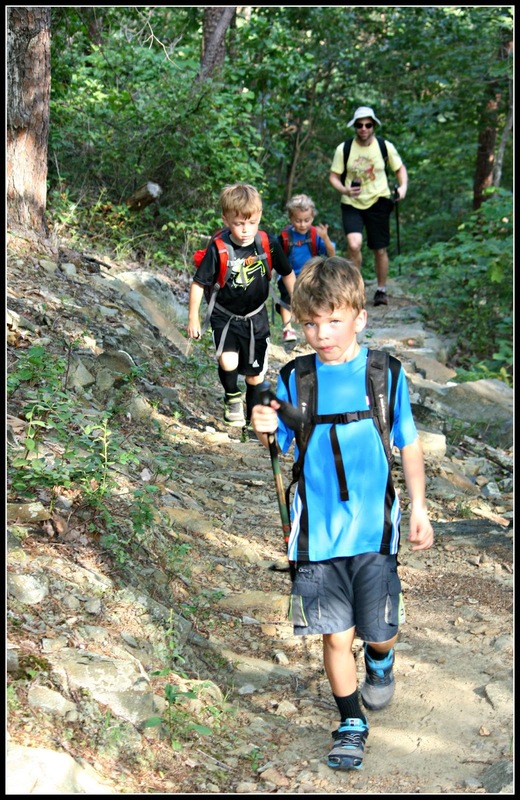 Recently we decided the boys are finally old enough to go on a backpacking trip. 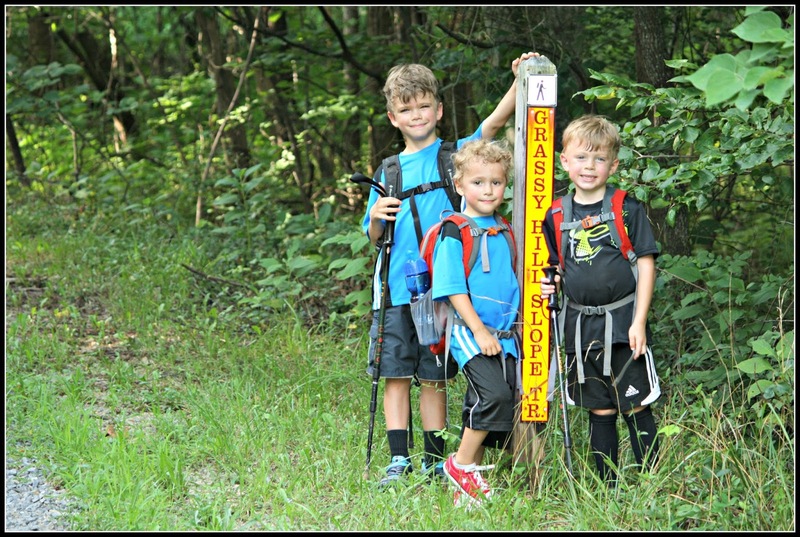 Paul and I did a lot of backpacking before we had children, and we've missed it. We're in the process of prepping for the trip, and as preparation we are starting to do some hikes with gear. We're starting small. 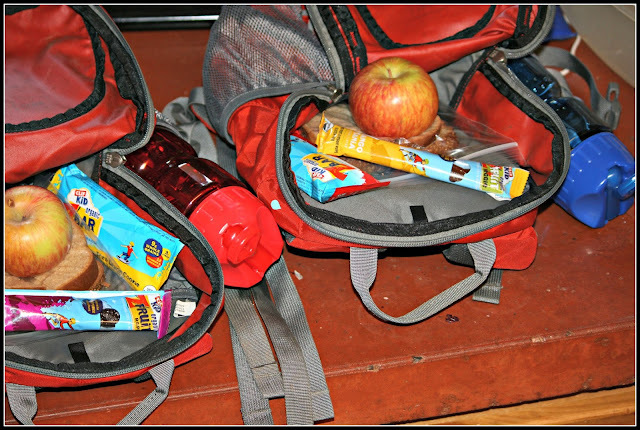 Packs with snacks and water. 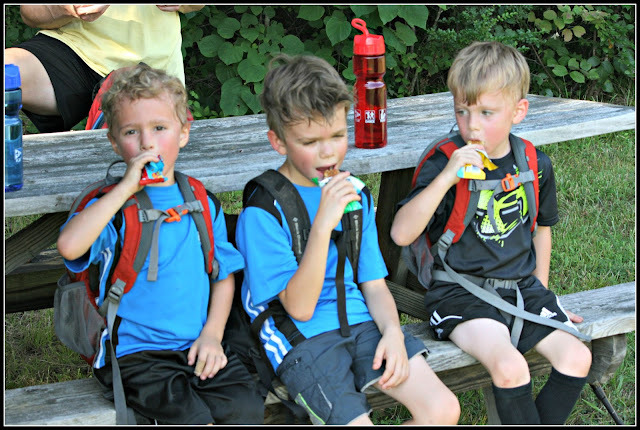 CLIF Kid organic snacks are some of our favorites. Designed to be nutritious snacks for growing kids' bodies, they contain no high fructose corn syrup, synthetic preservatives, or artificial flavors. 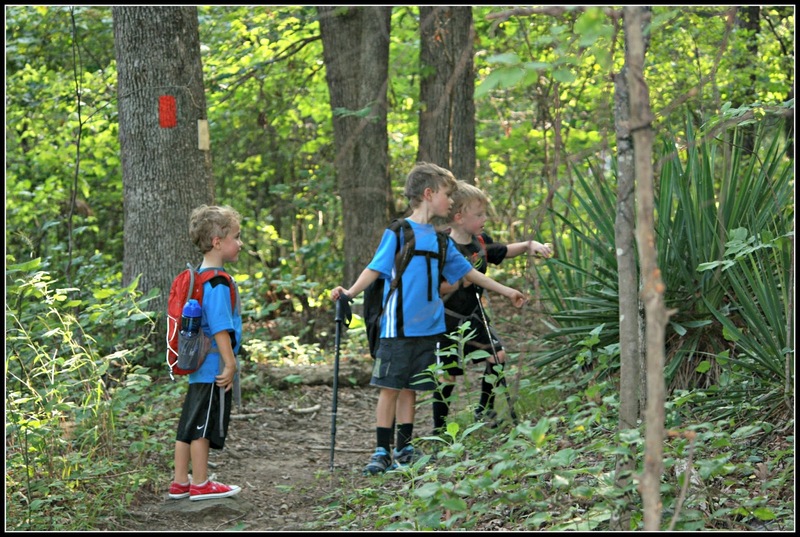 Outdoor play for us means taking advantage of all the incredible parks we have in the region. On this day, we checked out a new (to us) trail. 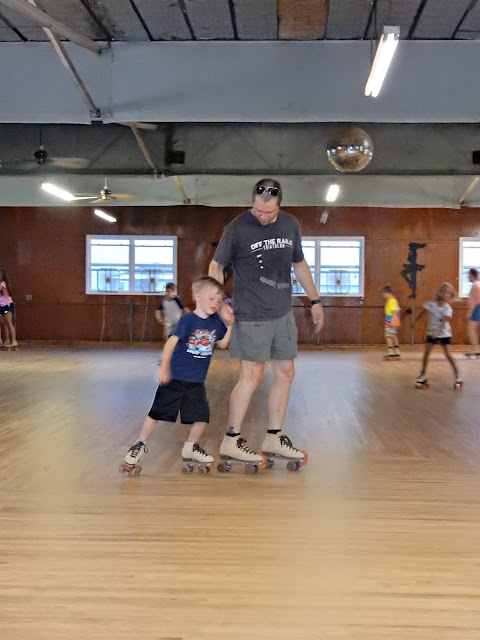 Prior to hitting the trail, the boys were having fun at a skate park, and being a 90+ degree day they were a little hot and sweaty by the time we were ready to hike. We figured we should refuel before we hit the trail. 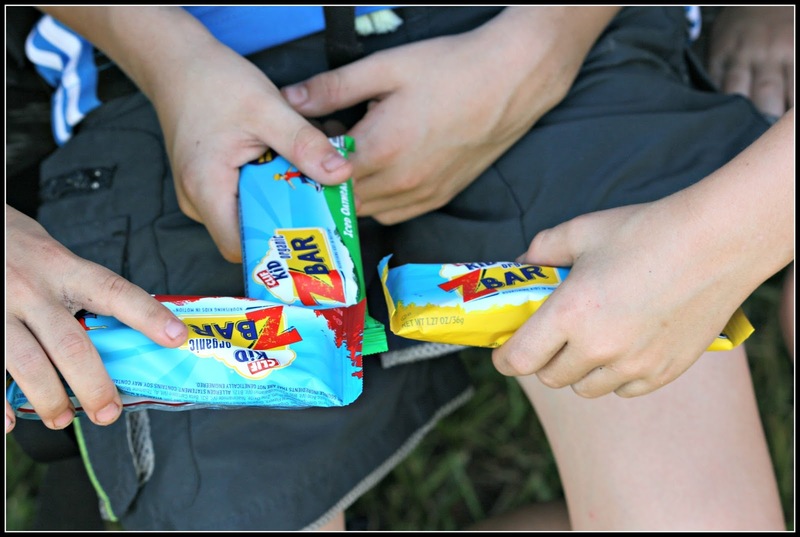 The boys enjoyed some ZBars, an organic baked whole grain snack that offers a blend of complex carbohydrates, three grams of fiber, and three grams of protein for added energy. On top of all that goodness, they have excellent flavor. The boys don't mind eating nutritious snacks when they taste this good. As a result, they know how to appreciate the little things. Like these unusual plants on the trail. The boys had to stop to check them out. They had a tropical flare to them, which you don't see too often in our region. If you take your time on the trail, you can see all sorts of interesting things. 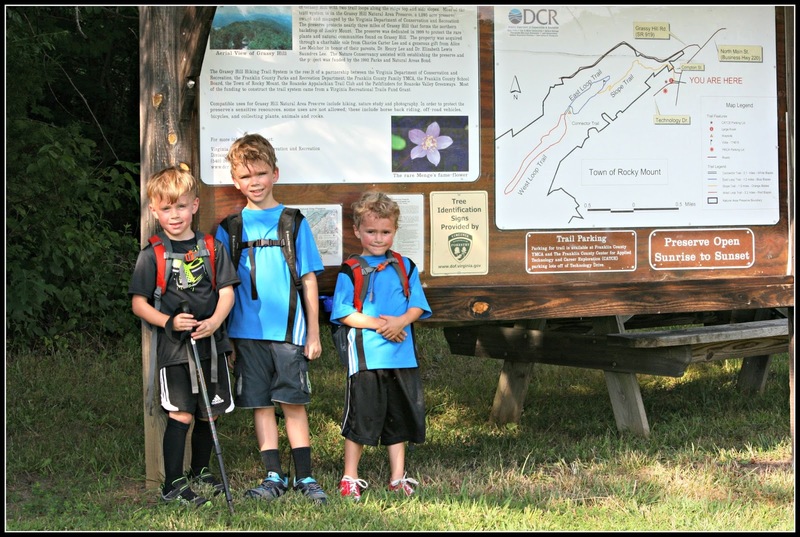 The boys are pros at spotting wildflowers, bugs and critters. They also know how to spot and follow trail markers. But on this day? I was the one who spotted something shocking. A BEAR! A black bear. I wish I'd gotten a picture. 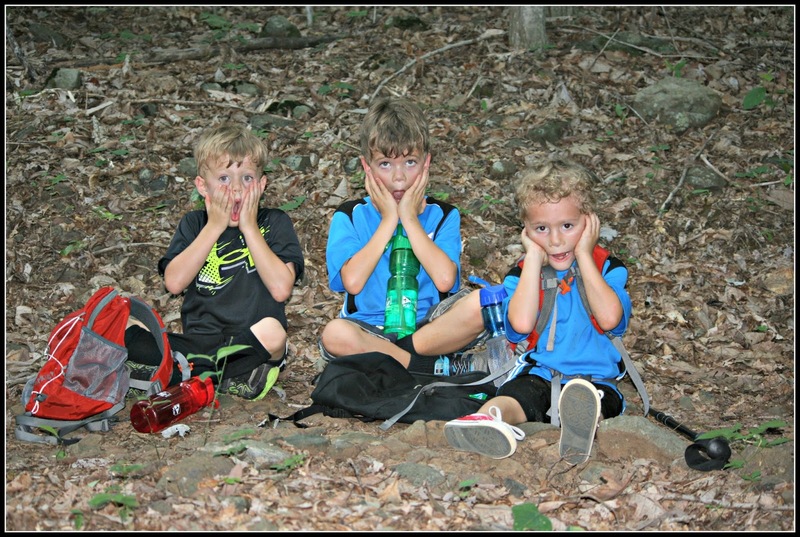 But instead I can offer you a picture of three shocked boys over seeing a bear in the woods. What a fun day. We have a few more test hikes planned before we go on our overnight backpacking trip. Stay tuned! 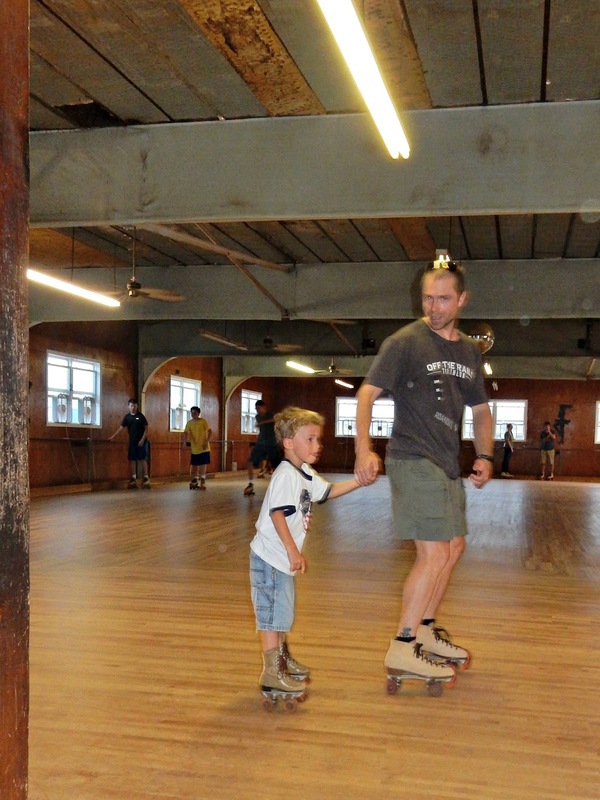 CLIF Kid is committed to getting kids out to play. They've created an online hub dedicated to helping parents get kids outside to play. 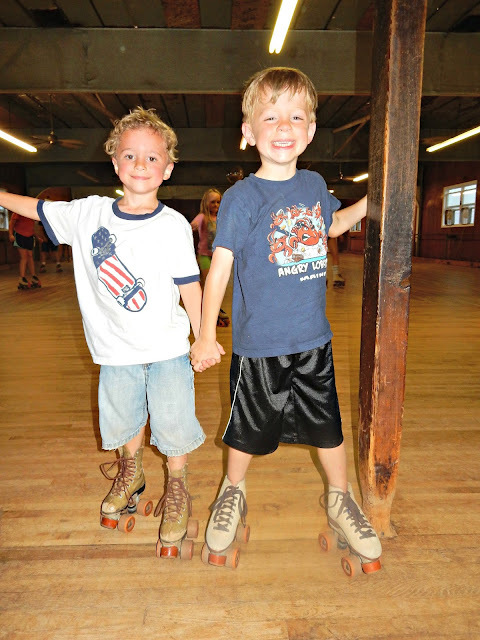 You can find tips and tools to inspire you to get out with your kids to play every day: http://bit.ly/ComeOuttoPlay. I hope you will check out this fantastic resource. You can use the hash tag #outtoplay to share your adventures on social media sites and connect with others. 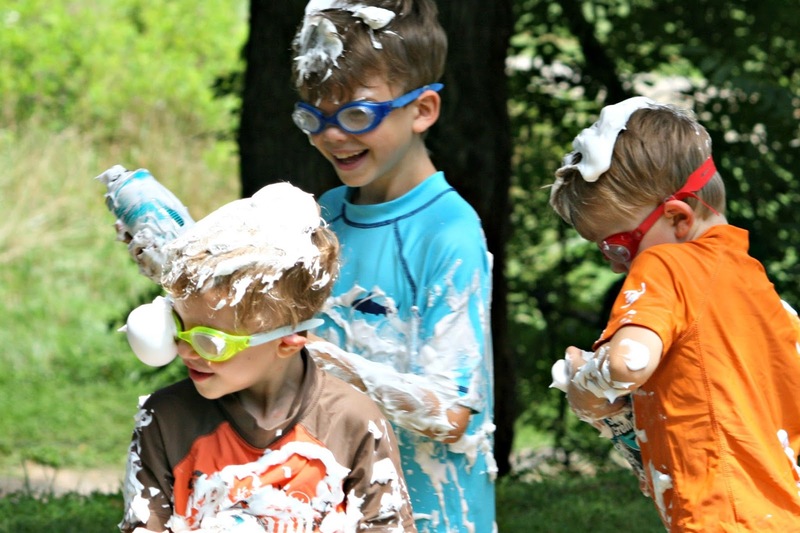 Readers, what kind of outdoor play do you love? 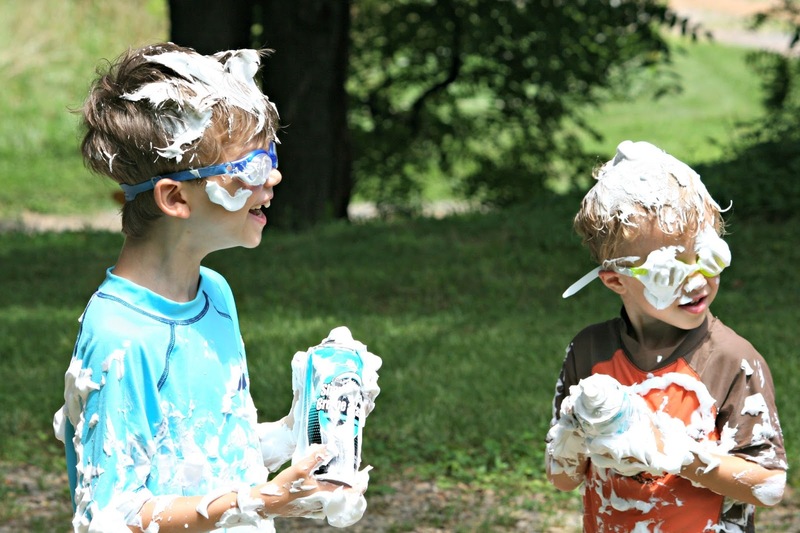 When we made our summer bucket list, I stuck 'have a shaving cream fight' on there. I thought the boys would enjoy it. They had no idea what I meant by this. But they were game. You can find shaving cream at the dollar store. 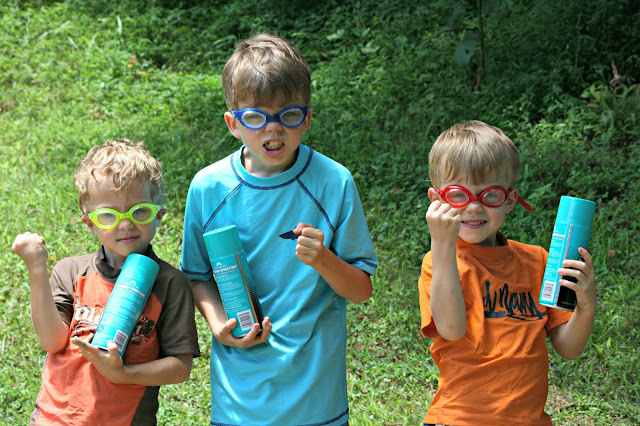 We dressed the kids in swimwear with goggles. The goggles are very important. We also set ground rules. We let them know that even if they couldn't see they should not remove the goggles. 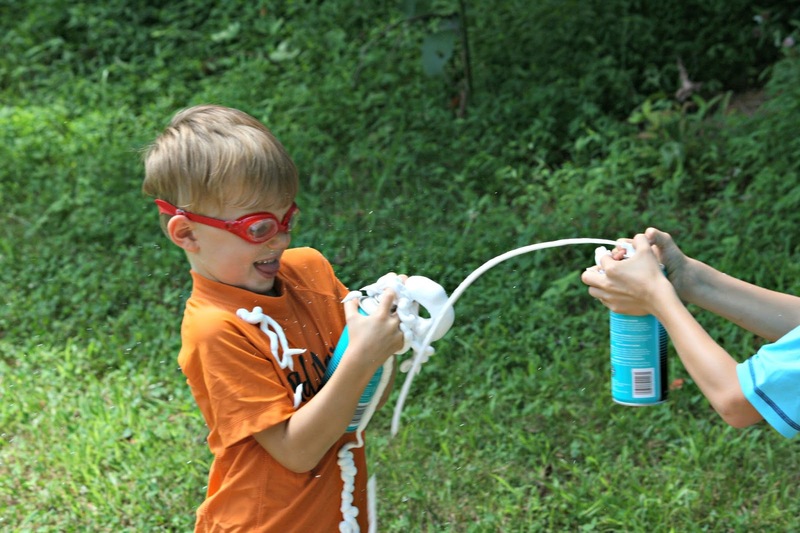 And then we had a hose ready to spray off goggles if needed. The main thing is that I didn't want them to get the product in their eyes. 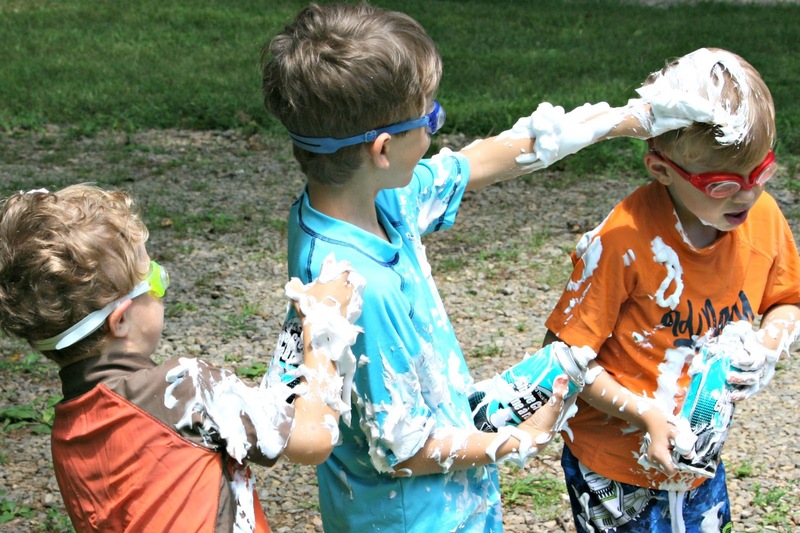 We also set the rule that if someone falls (because shaving cream does get slippery) that everyone stop spraying until they make sure the fallen person is okay. Good thing we have those handy goggles (you can also find goggles at the dollar store this time of year, but I don't know how reliable they are). Then, we simply turned them lose and were prepared to watch the entertainment. 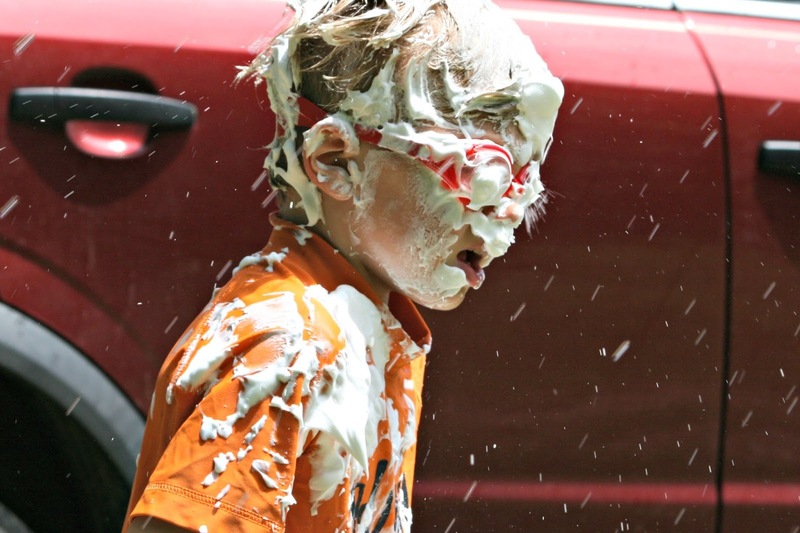 Nothing like watching your kids make a big mess in the yard. There were so many laughs and giggles. What is more fun than making a huge mess? And when they couldn't see? We just hosed them down gently with water. They knew not to try to take the goggles off. 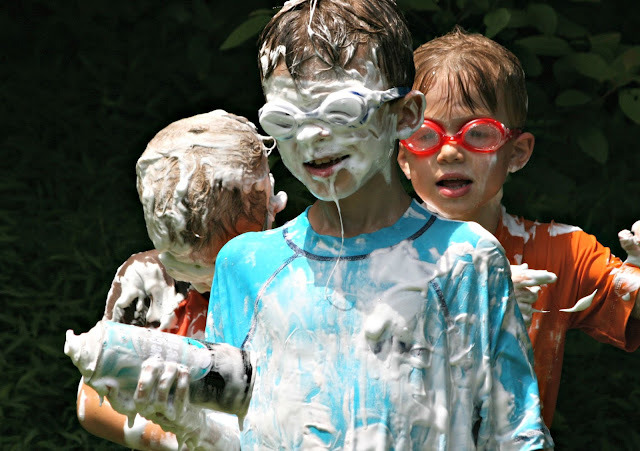 Once they were all done, they all got a thorough hosing, and then played in the yard until they dried out a bit. 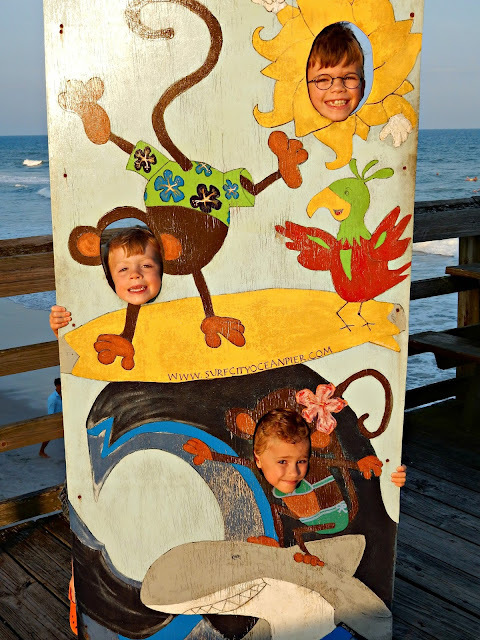 This is going to be an annual summer tradition for us. What a fun time! While we were on vacation a few weeks ago, we drove to Wilmington one day and toured the NC Battleship, a relic from WW2. The size of this ship is sombering. 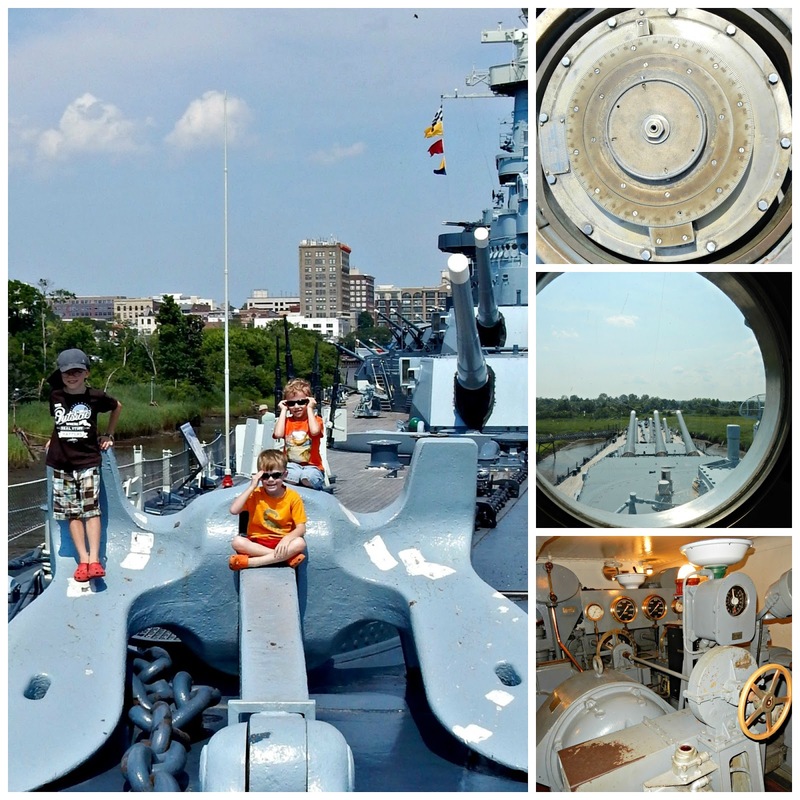 I remember touring a battleship as a kid. One thing that stuck with me is how stuffy and claustrophobic they feel the deeper you get in the bowels of the ship. That sensation hasn't changed, particularly in the heat of the summer. We went through every inch that we could. 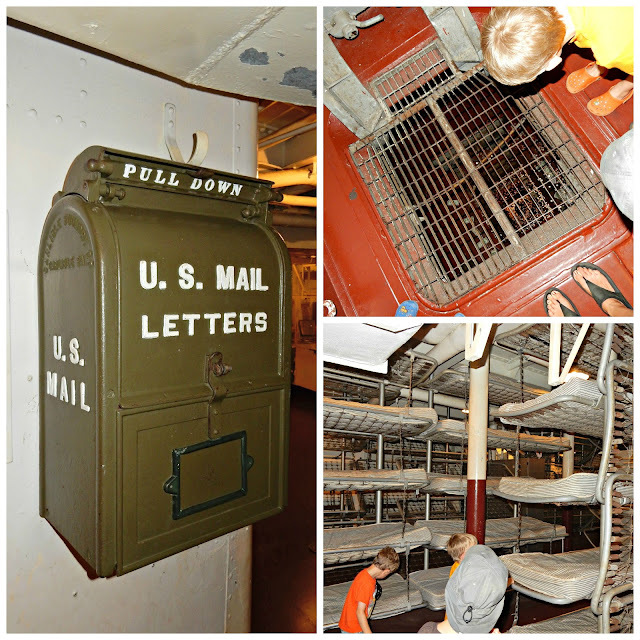 Below - the boys peek through the "wishing well", where people throw pennies, that drop several stories down through the ship. Here are some pictures from the kitchen. The boys stand boy a huge mixer, in the middle is a potato peeling machine, and then the industrial kitchen. 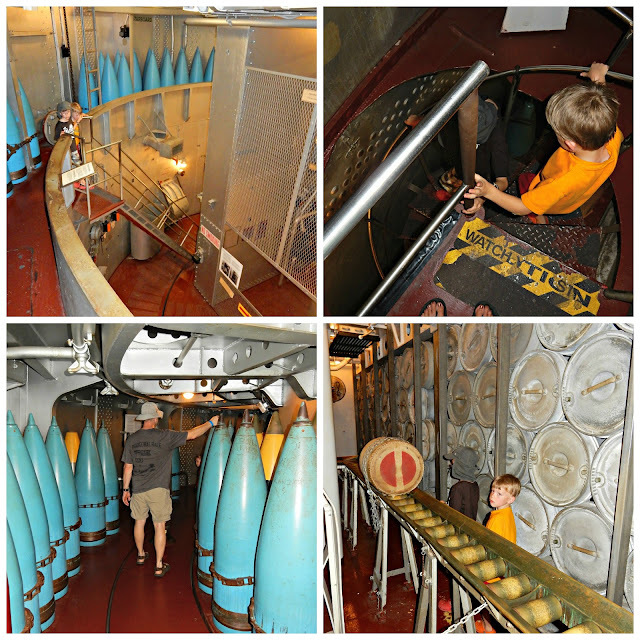 Some of the weapons stored inside the ship. We were three levels below here, I think. We got lost a couple of times in the ship. Yes, it is that big. 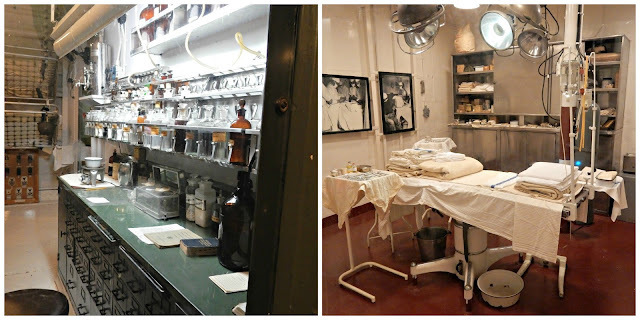 I had fun touring through the medical and isolation wards. Of course, I had to check out the apothecary jars, since I have my own collection at home. A few pictures from the upper part of the ship. In the top right corner is an interesting compass. I took so many pictures that I had to compile the best of them into these collages. We had a fascinating tour, and didn't emerge from it until a couple of hours later. 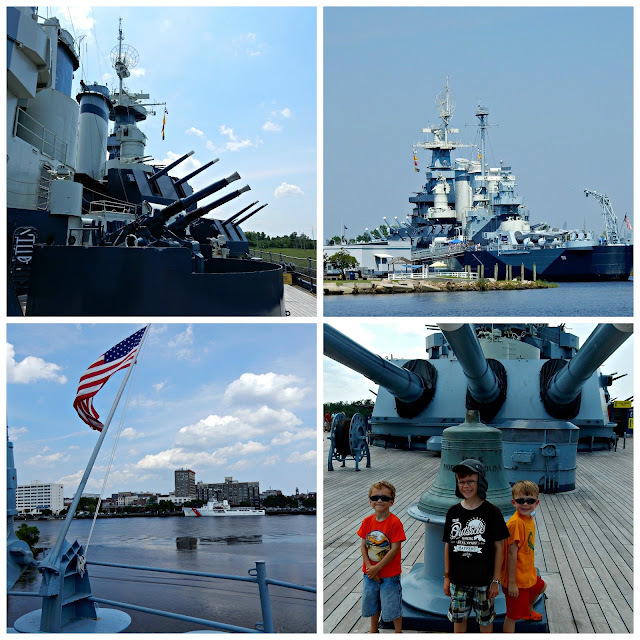 The boys thought that touring the battleship was even better than the serpentarium. It really made an impression on them. 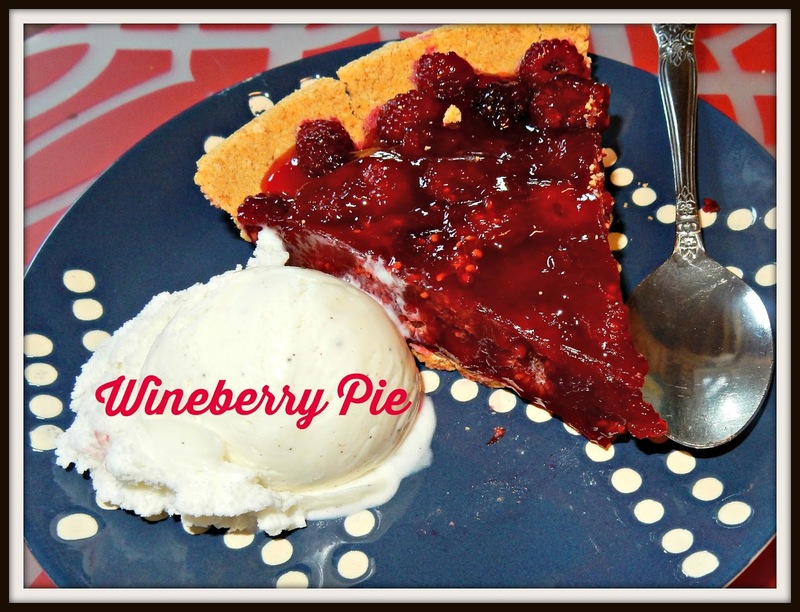 I have yet another wineberry recipe for you. This one is a new one for us, and it is by far our new and most favorite wineberry dessert. It has the most fantastic flavor! It is a little bit of trouble to make, but it is well worth the effort. Bring sugar and water to a boil until it dissolves to create a syrup. Cool. Put wineberries, syrup, lemon and vodka in the food processor and blend. Pour through cheesecloth to get the seeds out. Line a baking sheet or cake pan with parchment paper and pour ingredients into pan. Freeze for several hours, until set. Break into pieces and place in food processor again. Process until smooth. 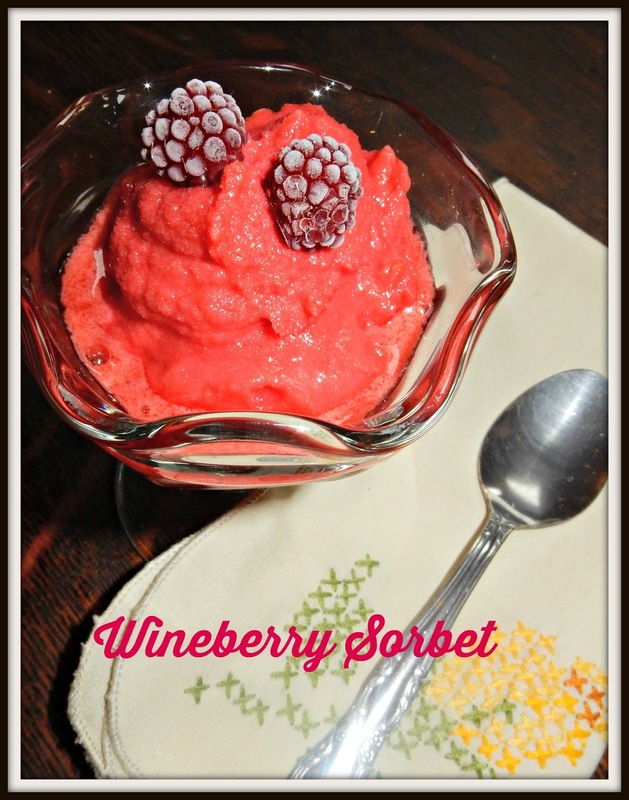 This is wonderful served over brownies, or even in an ice cream cone. The boys fought over the last bite. Apparently, I'll be making this one a lot this summer. Before now, I have been first female in only one race, way back in 2008. It was a small 10K in Danville. It was at 5:00 and very hot, but it poured rain during the race, which helped keep me cool. I got a huge trophy. I don't do a lot of trail races. But the Great Country 5 Miler is at a local park that I enjoy, so I figured I'd give it a shot. It was hot and humid the day of the race. The race was very hilly. I think the first hill was over half a mile long. There was another wicked hill towards the end of the race. And lots of little hills interspersed. I never thought I'd win. A female passed me and took the lead a mile in. She seemed strong and I couldn't seem to catch her. It wasn't until the last mile when she seemed to slow down just a tad, that I got the opportunity to pass her again. I was so tired at that point that I figured she would just pass me again before it was all over. I am not accustomed to winning. This was a VERY small race. The previous year, had I run it, I would not have been first. With the heat and the hills, my time was slow. I got lucky. I won the above pictured light box. It says first female on the other side. You fill it with Christmas lights. I've also seen them filled with tissue paper. It was fun to win something different than a trophy. 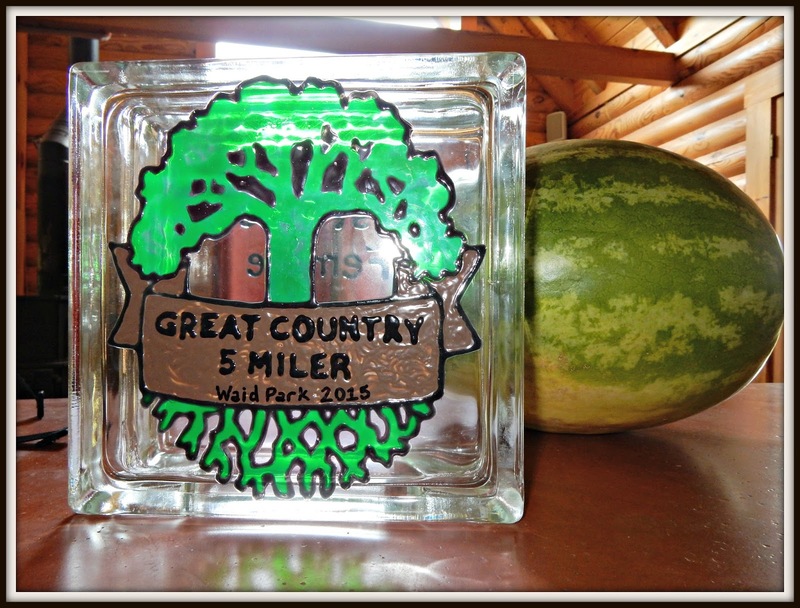 I also got a watermelon door prize. 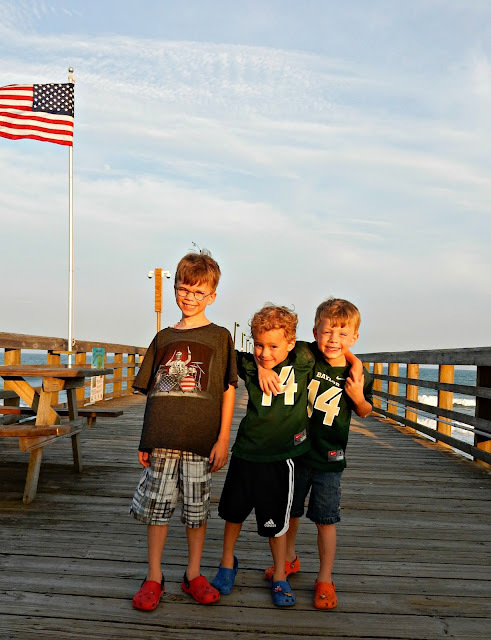 Two weeks after this, I ran a 5K at the beach on the 4th. I ran poorly and was disappointed with my time. But I knew it was a good speed workout, so no regrets in running that day. That's the thing about racing. You just never know what will happen. Maybe that's what keeps so many going back for more. We have oodles of wineberries that grow on our land. They are like raspberries. I've made all sorts of things with them, but am always trying to come up with new things. This year Paul has turned over all the berries to me (usually he reserves some for making wine...imagine that!). I decided to try a pie. Combine sugar, cornstarch, and water in a saucepan. Bring to a boil. Cook and stir two minutes until thick. Remove from heat and stir in gelatin. Cool for 15 minutes. Place raspberries in graham crust. Pour gelatin mixture over berries. Smush berries down slightly. Chill for 3 hours or until set. Readers, have you ever tried wineberries? 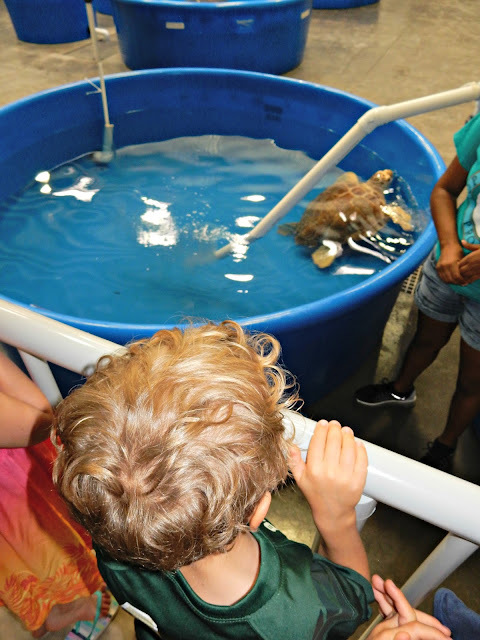 One of the fun activities we did while we were at Topsail Island to get out of the midday heat was visit the sea turtle rehabilitation and rescue center. The day we were there, 43 nesting sites for turtles had already been reported for the year. 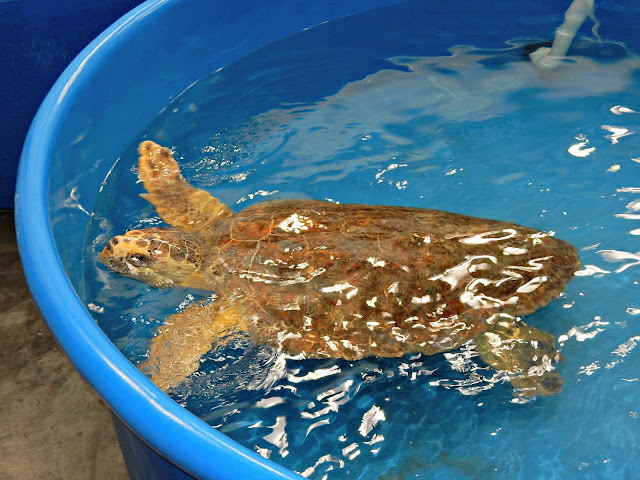 They had a large number of rescued sea turtles, three different species. They all had names and their own tanks. Some had gotten a turtle form of frostbite during the cold months. 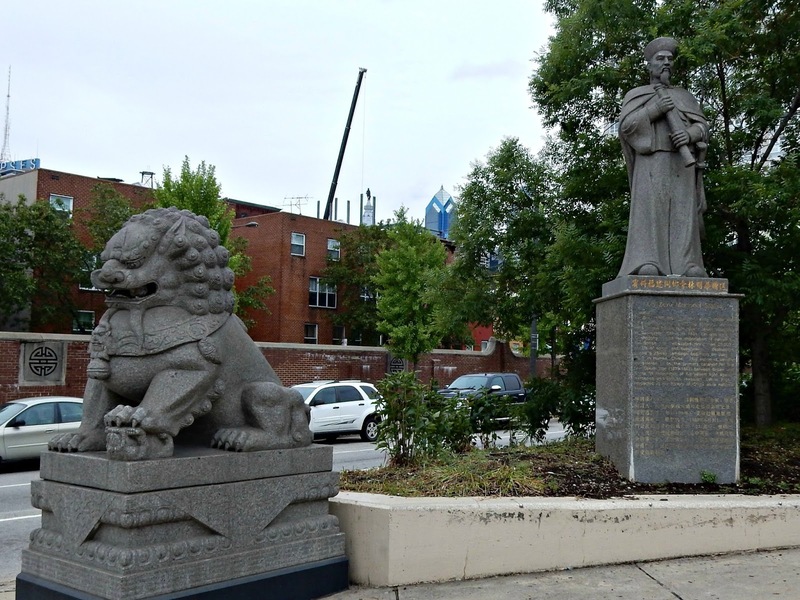 Others had injuries or illness. On the way out, we got to stop and talk to some of the sea turtle campers. They taught us all about squid anatomy and dissection. They were very enthusiastic. 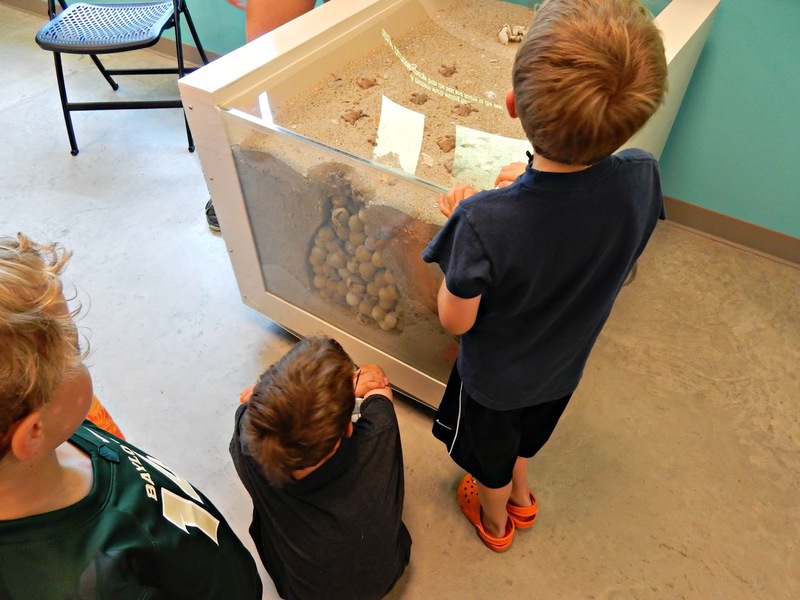 The boys loved touching squishy dead squids. What can I say? I always found dissection kind of interesting as a kid, too. So I didn't mind them poking at the dead squids. They got their science education for the day! 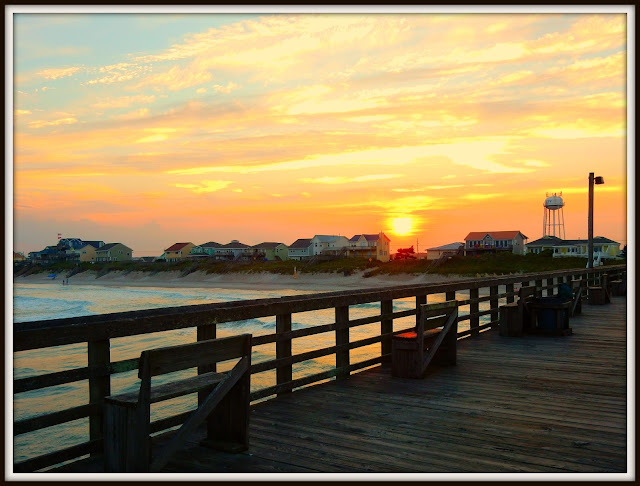 While staying at Topsail Island, NC, we decided to walk the pier one evening. It cost Paul and I a couple of bucks, but the boys were free. Even though this sign had seen better days, the boys insisted on being photographed in it. Getting ready to start the long walk across the pier. Piers are kind of creepy. They always seem rickety with wobbly boards. 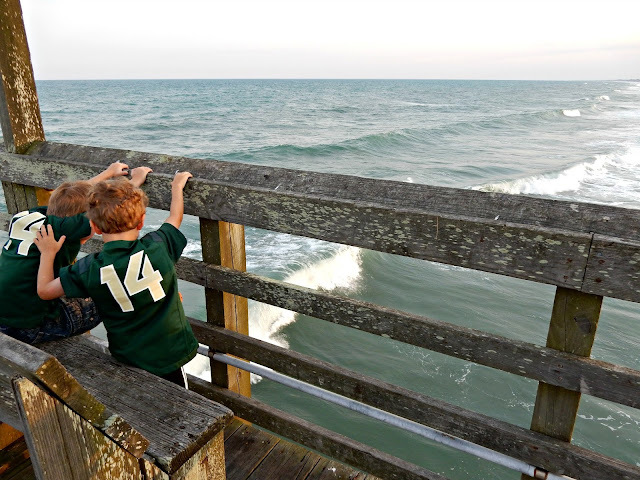 The boys check out the spot with the biggest waves. Cort and Reid look so sweet in this moment. Two seconds later they were having a big fight over something. 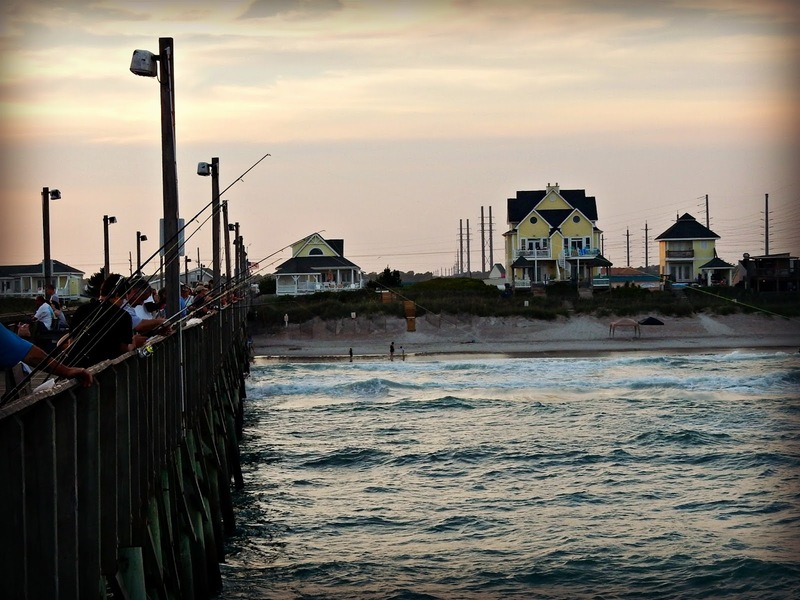 Lots of folks were out fishing this evening. We saw a few people catch fish. No sharks, from what we saw. 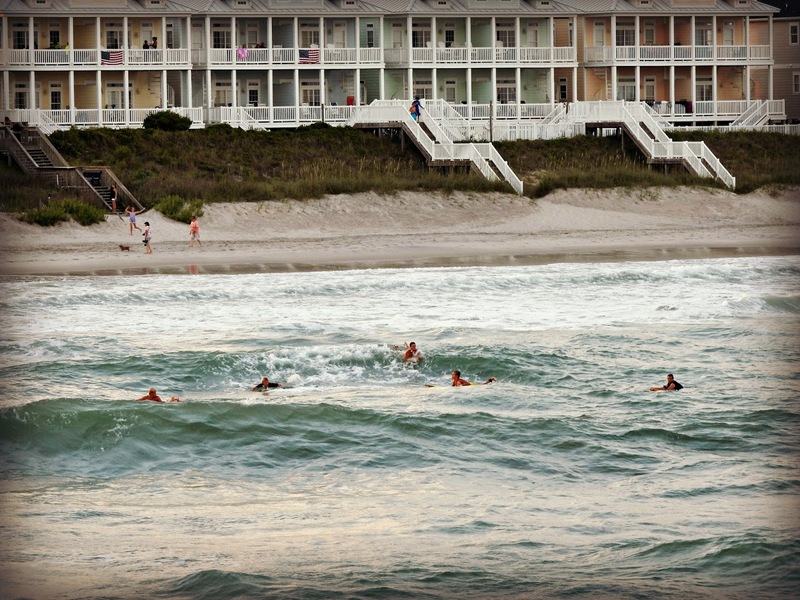 The surfers did not seem phased a bit by the recent shark attacks on the NC shores. Guess surfers are invincible. As we returned to the car, the sun was setting behind the island. It was a beautiful end to our day. Readers, have you had any beautiful endings lately? Last summer, Pierce's Pre-K teacher wrote him a letter about vacationing on Topsail Island, and how it was very special. She's been going for over twenty years. We thought it sounded neat, and last January booked a townhouse rental. 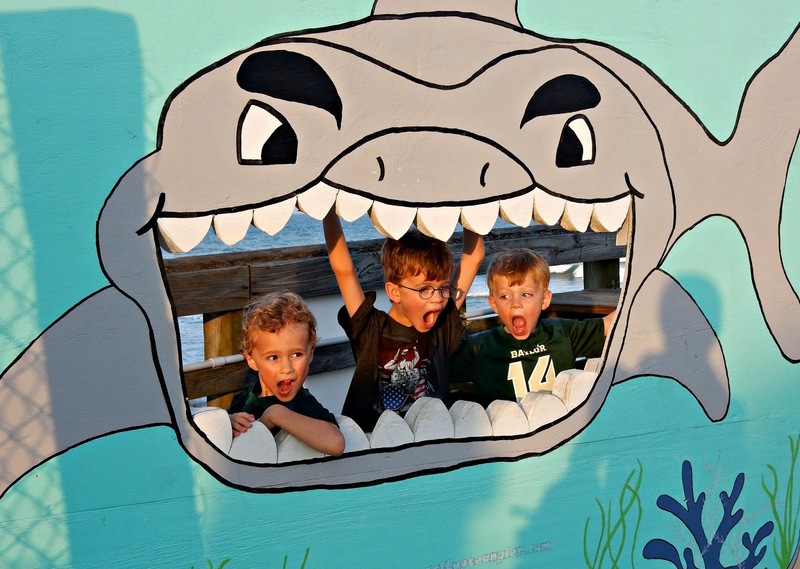 Three weeks before we left, NC started having issues on their beaches with shark attacks. Then two days before we left, an 8 year old boy was attacked on Topsail by a tiger shark, and he was only knee deep in the ocean. We decided to play it safe and only get in at the ankles. It didn't spoil our fun, though. I have many pictures to share with you in upcoming posts. But first, check out all the shark teeth I found! 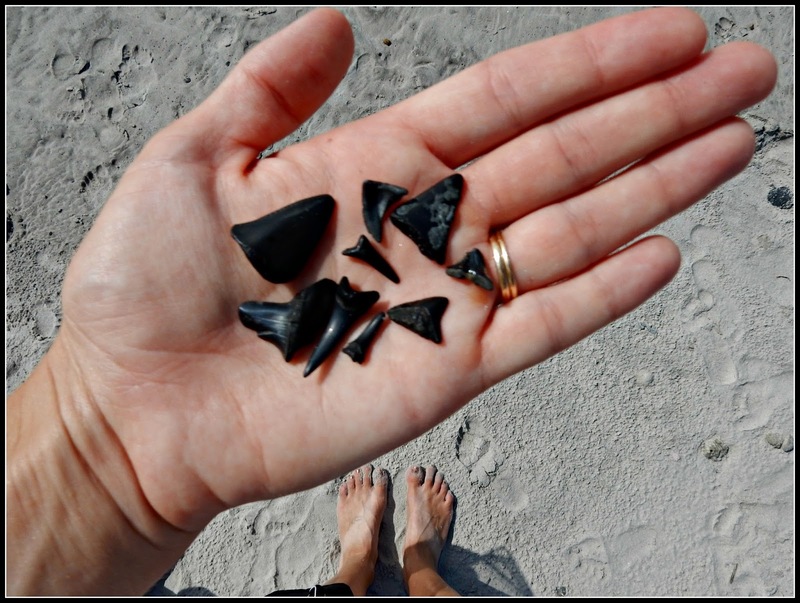 My friend, Ginger, told me that as a kid she filled up an entire cigar box with shark teeth from Topsail Island. I didn't get that many, but I had a splendid time searching for the ones I did find, and I ended up with a grand total of 24. Although I am not scared of sharks, I did use caution and avoid doing anything further than wading in the ocean this time around. How about you, readers? How do you feel about sharks? 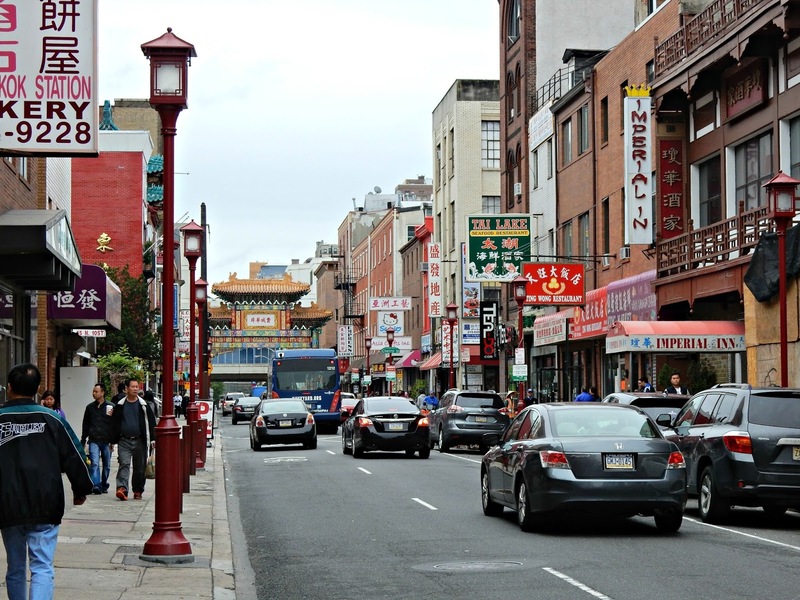 According to my front desk friend at the hotel, Philadelphia has the second largest Chinatown in the U.S. 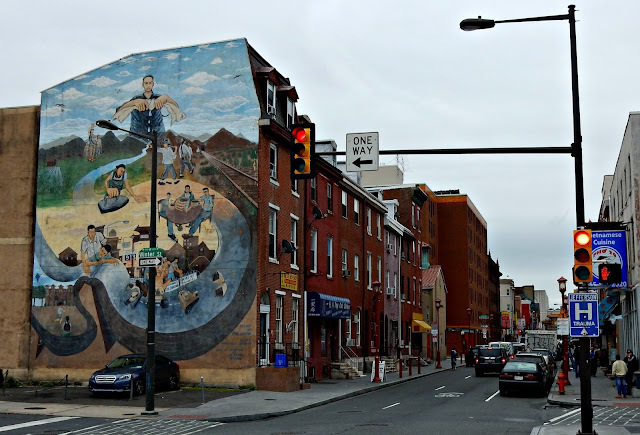 I had already been to the ones in San Francisco and Washington D.C., so I was excited to check out Philly. It was only about a block from our hotel. So of course, I had to do some exploring. I actually didn't see a single tourist the two days I walked around Chinatown. But then again, it was a couple of unusually cold and rainy days in a row. One morning Paul and I ran through Chinatown and saw an elderly group of Asian women doing an exercise in which they did some slow, methodical dancing. It was very interesting. 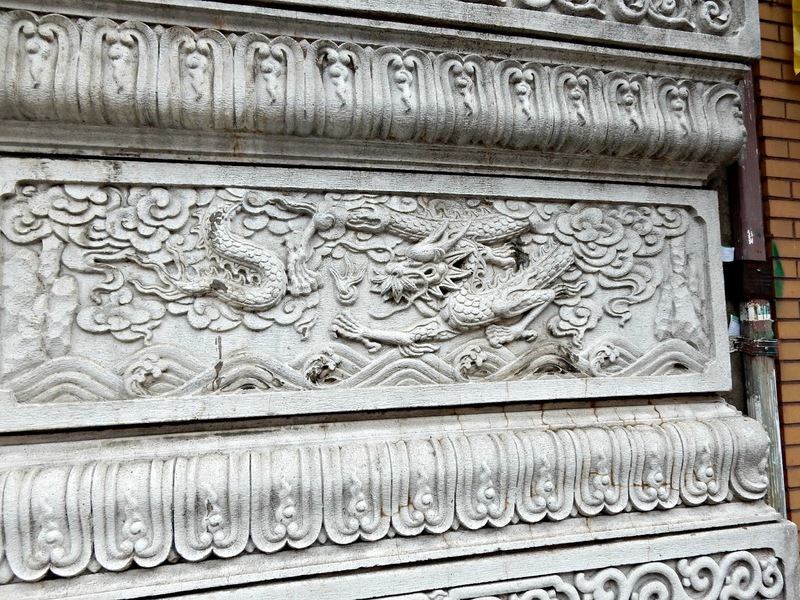 Some of the buildings were very ornate. 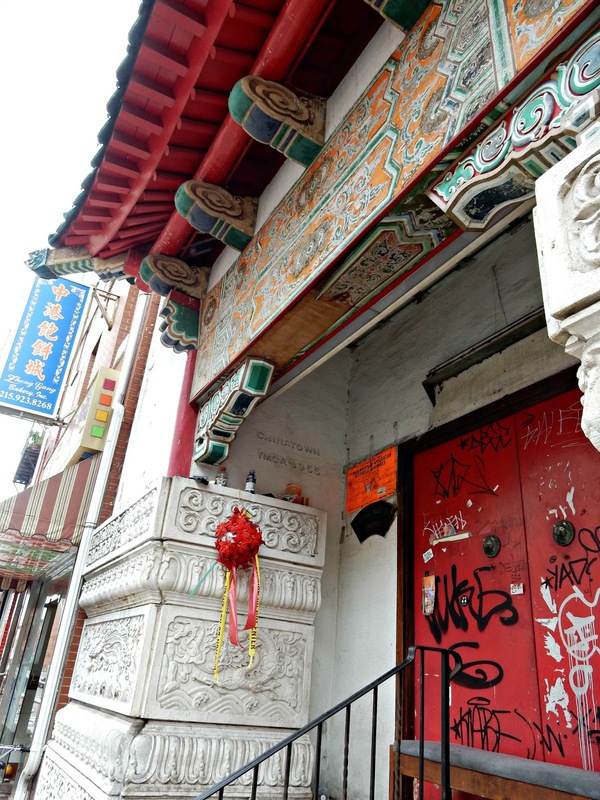 This poor building was more decrepit than you can tell from the picture. Same building below. You can see in the corner that it used to be a YMCA back in the day. A shame that it is going to waste now. I wonder what happened to lead it to this. 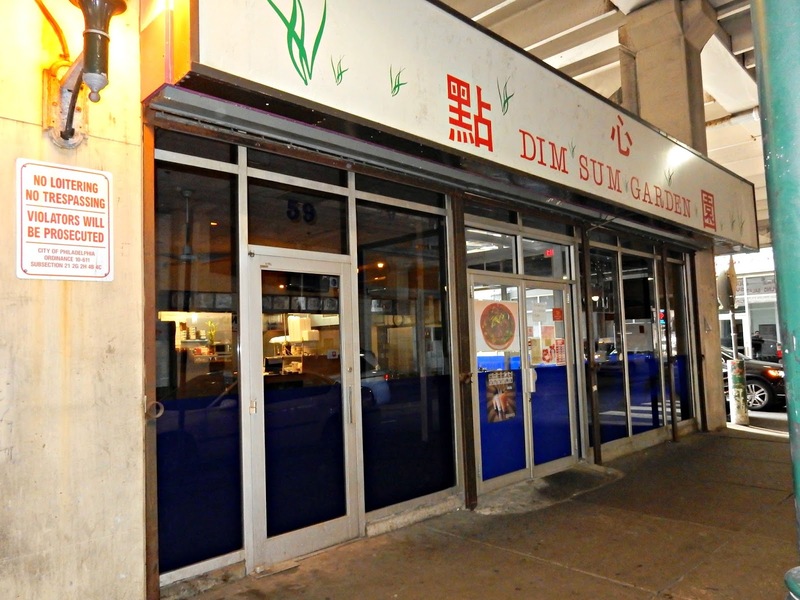 One day I had a late lunch from this Dim Sum restaurant. I had a delicious noodle soup with tofu and bok choy. It was spicy and warmed me up after being chilled all day. The proportion was HUGE for $6. I could only eat half of it, despite how much I loved the flavor. Yes, I am an adventurous eater, and I adore trying unlikely street restaurants. 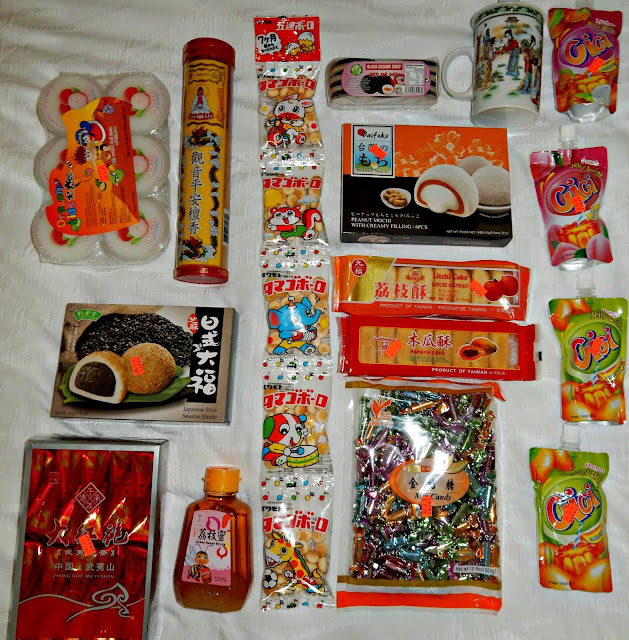 Here are the goodies I picked up at various shops in Chinatown. I confess that some of them were not very palatable. One of the candies, in particular, was inedible. But it was fun to try new things. Perhaps I should have brought back a bunch of Dim Sum instead? 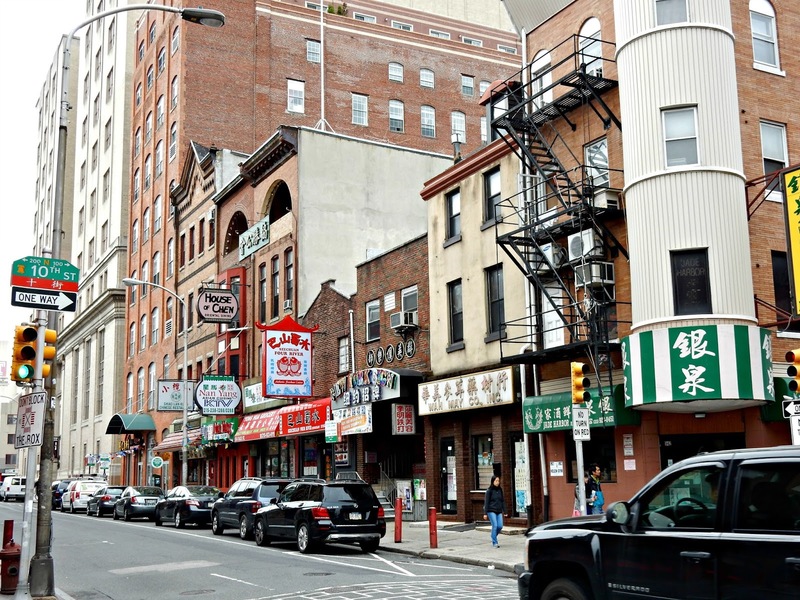 Readers, have you ever been to a Chinatown?